The photo of this book cover and the portrait of the artist are here: Fernando Botero Angulo (born on April 19, 1932 in Midellin, Antioquila, nationality: Colombian, field: Painter, Sculptor). On p.p. 154-64 is published the interview of Fernando Botero by Peter Stepan in Munich on may 8, 1986. 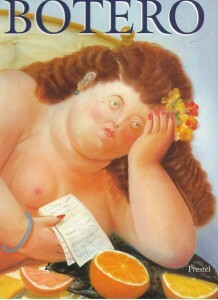 Botero: I want to paint people as still lifes. Stepan: Does the fulness of body correspond for you, to richness of mind, and spirit? Botero: I can only explain why I think this kind of art is effective, but not what it was that attracted me to it in the first place. That’s intuition. I can’t say why I chose this particular art, why I work different from Giacometti. “Fat” art has always been the most important art. Look at Greek art-it’s at its greatest in the 5th century, when its figures are most volumnious! Botero is an abstract artist in the most fundamental sense, chosing colors, shapes, and proportions based on intuitive aesthetic thinking. While his work includes still lifes and landscapes, Botero has concentrated on situational portraiture. His paintings and sculptors are united by their proportionally exaggerated, or “fat” figures, as he once referred to them. “The artist is attracted to certain kinds of form without knowing why. You adopt a position intuitively; only later you do attempt to rationalize or even justify it”. Botero painted the abuses of Abu Ghrab prison during the Iraq War between 2004-2005 as a permanent accusation: 85 paintings and 100 drawings in exploring this concept and “painting out the poison”. Last year in Calgary there was an exhibition “The Baroque World of Fernando Botero” (August 21-November 14, 2010), Glenbow Museum, this year the presentation had been done in Winnipeg. So, Botero’s art is traveling around the world. At the moment the famous artist lives and works with his wife Sophia in Italy. We wish them good health and more artistic innovations in years to come because they both are artists.